Labour Day is an annual holiday dedicated to works. In most countries, labour day or labor day is linked with international workers’ day and celebrated on different dates. 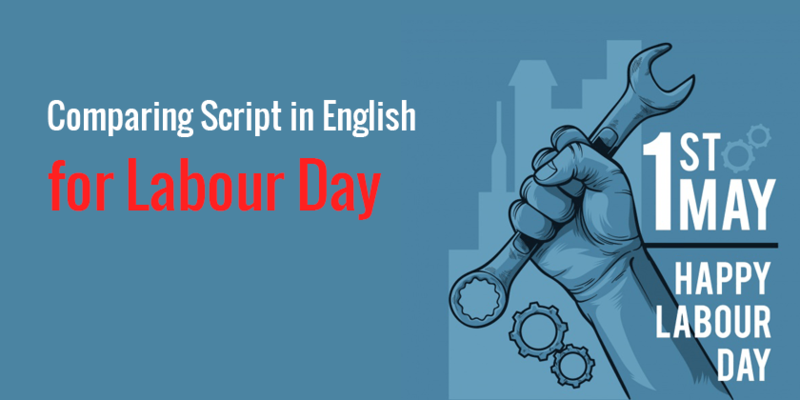 This day is important for the labor movement in the country, in addition, Labour day is a public holiday in many countries and the people celebrate and thank the labors for their hard work and struggle, hence in the article, I have written comparing script in English for Labour Day. You may utter these lines in labour day celebration. Ladies and gentleman, hello and a warm welcome to all of you present here on this special day. Today is the day we honor the contribution of the heroes who always work hard for the prosperity and economic strength of the nation. Labor Day is the day to “throw down your tools,” and eat too many hot dogs while thanking workers for their collective contribution to the strength, prosperity, quality of life, cold beer, and great sales enjoyed across the nation. We want to salute them all on this special day for all hard work they do, so celebrate with joy this very very happy Labour day. I have always felt that with true talent, and commitment to hard work of labors, it’s possible to achieve an enduring respect and appreciation. Of course, it should be noted that millions of hard-working workers around the world, like those in the retail and service industries, along with those in law enforcement, public safety, and health care observe Labor Day by working as usual. Perhaps they deserve the special appreciation of those of us who do get to spend the day eating the hot dogs and drinking the beers. The first Labor Day holiday was celebrated on Tuesday, September 5, 1882, in New York City, in accordance with the plans of the Central Labor Union. Moreover, The Central Labor Union held its second Labor Day holiday just a year later, on September 5, 1883. The labors have been the valuable members of our country and we have noticed all the hard work they have put in. keep it up heroes. All the hours of hard work have really paid off on your current project. You have done a great job as workers, and really appreciate the extra effort you’ve put into the revival of our country. Your willingness to help out wherever there is a need is greatly appreciated. It’s that kind of flexibility and dedication that will help this country grow to its full potential. Success is not an accident. It is hard work, perseverance, learning, studying, sacrifice and most of all, love of what the labors are doing for our country.